How do you like your roast pork? The answer for most people is probably tender and succulent – but with a crackling skin like thin, tasty, salty glass. For me, a good crackling is key. I mentioned in my post about my Chinese twice-cooked sticky pork belly that I had plenty of left-over pork ready for a roasting, so tonight was the night to try my hand at creating the very crunchiest crispy pork crackling! I Googled around the internet for a while, reading other people’s recipes for inspiration, and found that there were just so many different methods. 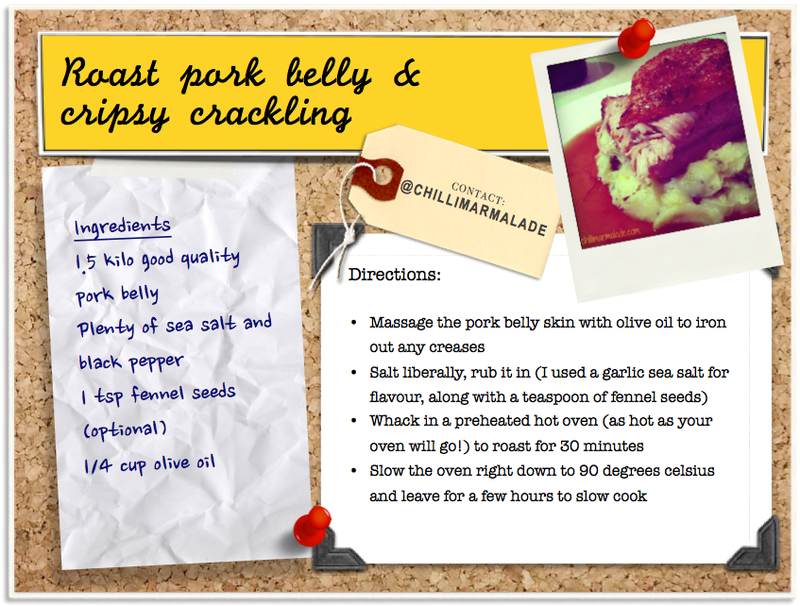 Everyone professes to know the secret of the crispiest pork crackling known to man. So, I did what I always do when I can’t make a decision – I turned to Twitter! I used a really lovely wild garlic sea salt from a Swedish brand called Falksalt – it helped flavour the crackling and meat with a subtle garlic hint, without being overpowering. 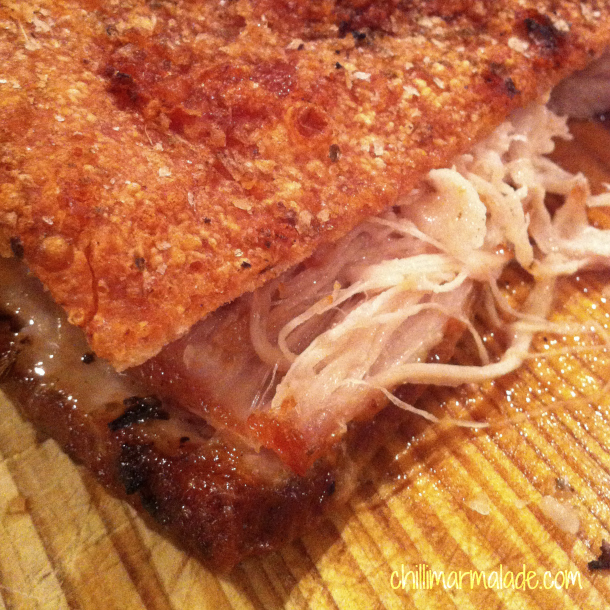 Also – next time I’ll be using a little less salt, as the crackling was a touch salty. Other than that, follow my four steps and you can’t go wrong! When I eventually took the pork out of the oven (after 2.5 hours of slow cooking), it was pretty close to perfect. The meat was tender, luscious, and fell apart when poked with a fork. The crackling was crisp, but didn’t shatter the teeth, and had a satisfying snap with no chewiness. 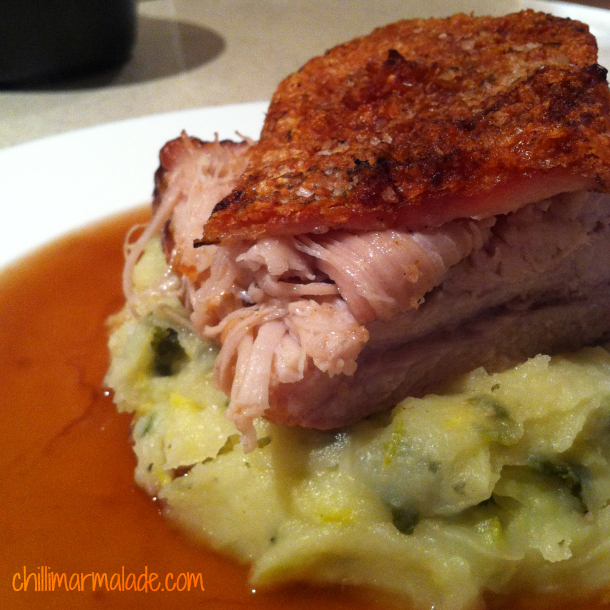 Tags: baking, cooking, crackling, dinner, food, meat, pork, pork belly, pork crackling, recipe, recipes, roast. Bookmark the permalink. This just popped up on my reader and I think I started drooling…. You don’t like pork!? You haven’t tried this recipe! 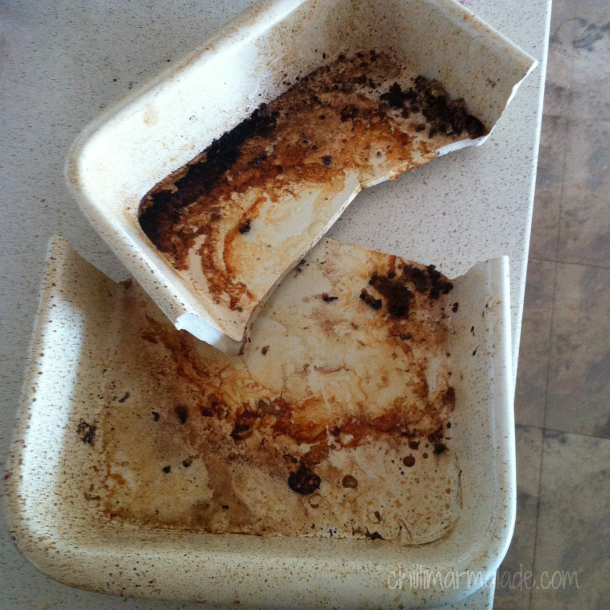 Oh that poor dish, at least it died for a good pork cause. It’s had a good life. Now I’ve got an excuse to go shopping for a new one! Oh YUM! I haven’t had breakfast yet and this is. what. I. want. YUP. So…how high does your oven go? I only have ceramic and pyrex baking dishes so I wonder if pyrex would work? Other than that I have cookie sheets. What did you switch to? 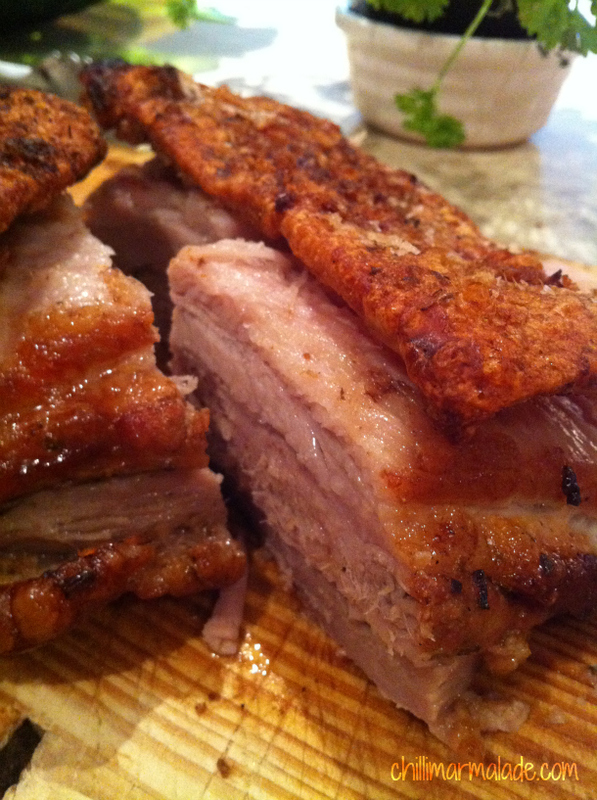 I love a good pork belly with cracklings. Very nicely done. This looks like something that could possibly be done in a smoker grill — it would keep the heat out of the house in the summer. I’ll have to try that. Thanks for the post — I love pork! 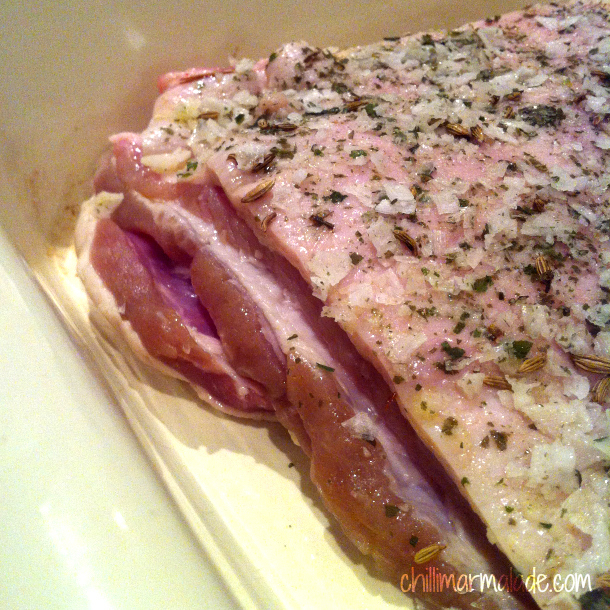 I’ve never made pork belly. This looks uncomplicated and so delicious. I’m glad you came to visit my blog because upon returning to your I realize I must check in more often! Never would have thought to try making this at home, but now I can’t imagine not making this. Mouth watering. That looks amazing. I love roast pork. I’m definitely giving this a go!